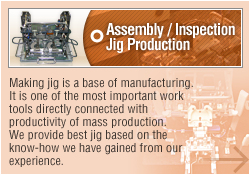 We, Nagasaka Co., Ltd., have a proven track record in rapid prototype processing, assembly/inspection jig production and assembly processing. 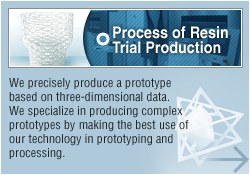 Those products include trial production and mass production. In order to meet our customers' various demands, we offer products with "high accuracy", "high quality” and "fast delivery" at "low cost." Nagasaka aims at continuing to be an indispensable company for our customers and society through business activities that only we can achieve and others cannot!, such as "advanced prototyping/cutting technology in resin trial production" and "quality stability in assembly and manufacture." 2011.04.11 Processing Examples, Cutting & Grinding Process [Refined Process] was added. 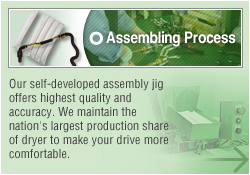 Production examples of jigs were updated. 2010.12.27 ISO 9001:2008 examination registration was updated. 2010.12.02 Production examples of jigs were updated. 2010.09.22 ISO 14001:2004 examination registration was updated. 2010.09.01 Corporate information was updated. Processing Examples, Cutting & Grinding Process was added. We obtained the certifications of ISO9001 and ISO14001. Based on these standards, we promote the eco-friendly business by environmental management system, while we keep on developing higher quality. We have partnership with EOS company.